Art Style: Precipice Micro-Review: But What If It's Art? Skipping past dull debates about whether games are art, consider this new DSiWare puzzle game that is labeled as art. Okay. So it's art. What to make of that fact? Hammers, hula hoops and other things you use with your hands or hips are not often described as art — at least not as frequently as are paintings and and sculptures. They are not things you often stare at, think about and interpret over a glass of fancy wine. Yes, a little downloadable DS game, Art Style: Precipice, sent my mind in this direction, triggering my art interpretation muscles just as it did those joints in my fingers that can report to my brain about whether this game is a good use of a subway ride. The Best Block Pushing Money Can Buy: One must discuss gameplay first, art fans. Precipice is the latest Art Style game, all of which are simple and one of which was based on cutting and folding boxes. This one defies those who feel Zelda and God of War were the omega of block-pushing gameplay. There are two modes of play (plus relaxing unlockables). 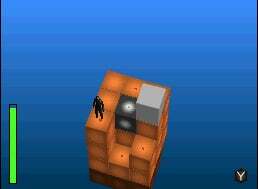 Both modes place a little d-pad-controllable man on a floating floor of cubes as more slowly rain from above. He can push and pull them, each step illuminating a tile with a color. Every footfall scores points. In one mode, making full-length paths of a color triggers a multiplier; the other mode rewards points for coating a smaller floor with one color. Plummeting blocks lay foundations for new floors. They'll also kill you if you don't move. The challenge to score, push and climb feels fresh despite being almost entirely what the most tedious Zelda and God of War puzzles are comprised of. Why? I think because it's simple, pure and swift, gameplay for gameplay's sake, motivated by the chase for points. The Folly Of Man: This game won me over not just because of its gameplay but because of what it made me think about. Its abstraction begs interpretation, like the most simple and mocked modern art. Here is a virtual man striving to reach new heights. And here is a gameplay system that heavily encourages the player to score their biggest points early. And there's a twist. In the game's main mode, the points the player is scoring — the numbers twirling the scoreboard to grand new mileages — do not count unless the little man reaches the top of 10 levels of plummeting blocks. This is not easy, as the bottom-most floor occasionally drops away. A metaphor reveals itself: the zeal for success early in this man's journey can lead to a fleeting thrill, one wiped away, more often than not, by death later on. That early success doesn't count if he can't survive a full journey to the heavens. It is hard to reach that 10th floor, by which time scoring progress is slow. Add this idea: Each step and each push of a block wears this man down. Each labor diminishes his health bar. Only special blocks boost his meter. This is a game where each literal step toward success is debilitating. To live and to do is to decay. How sad. The Lumines and Anti-Lumines Problem: All's well, unless the Lumines problem occurs. That's the issue of a game taking too long to get hard, forcing too many repeated playthroughs. The opposite of this problem would be a game being too hard right away before becoming too easy. Both are issues here in the game's two modes. In the main mode, the best scoring tactic — coating the ground floor until it is red — works or fails in the game's first 20 seconds. Failing to do that seems to make the rest of the game, pun-intended, essentially pointless. Score big early or restart. The game's other mode, tower, proves to start too easily, just like Lumines. Both modes are fun, but both reveal disappointing design problems. I'm glad I played, and I'm glad I got a chance to interpret what I experienced. Next time someone wants to treat games as art — or explore the reliance on block-pushing puzzles — please consult Art Style: Precipice. Art Style: Precipice was developed by Skip Ltd. and published by Nintendo for download on the DSi on August 3. Retails for 500 Nintendo points ($5 USD). Played all game types. Did not drink wine with pinky extended during any of it.